Cigar smokers are an accommodating bunch, sometimes to a fault when it comes to fighting the anti-tobacco lobby. The anti-cigar forces have learned to never ever be happy with the status quo no matter how anti-tobacco that status quo already is. Case-in-point is Santa Cruz, California, where anti-smoking zealots have passed one of the most oppressive smoking bans in the country. The law covers all “public” indoor and outdoor spaces including parks, beaches, restaurant patios, and sidewalks. Despite that, when smoking ban lobbyist group ALAC (American Lung Association in California) was handing out grades for cities, it gave Santa Cruz a “D” for not sufficiently being against so-called second-hand smoke. When I visit websites with foreign languages Google asks me if I’d like to translate them into English, which is helpful enough. At times, however, it wants to translate pages that are already in English. For example, Google wants to translate our Stogie Reviews Archive from Spanish to English, which is understandable given the hundreds of cigars listed there with Spanish in their names. More mysterious is why Google has repeatedly tried to translate pages on a certain online auction site (known to some as the “devil site”) to French or even Czech. While there has certainly been a trend towards bolder cigars in recent years, I’m also seeing a counter trend among some cigar enthusiasts. An excellent mild cigar, with all the subtleties it can have, is one of the most challenging cigars to blend. That makes such a superb mild smoke all the more impressive. Big fat "dittos" on the new trend toward "Magnificent Mild Smokes." I used to look for stronger, fuller-bodied cigars in the search for more flavor, but in the last couple years several manufacturers have shown that you don't need full body or strength to achieve greatness. 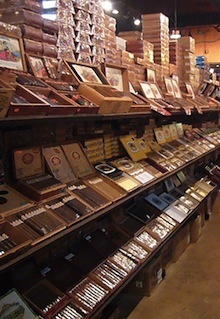 My favorites are the Connecticuts from Oliva, Camacho, Xikar and Nub, as well as the CAO Gold Vintage. All have as much flavor (or more) as the prestige brands like Davidoff, Avo, Griffins, etc., but cost less than half the price. Kudos to those makers for giving us greatness without breaking the bank! Anti-smokers are unreal… a full ban in parks, beaches, patios and they still give them a D? What's an A? 20 years in prison for anyone caught possessing tobacco? Patrick – I couldn't agree more with you about good mild smokes. They are overlooked far too often.